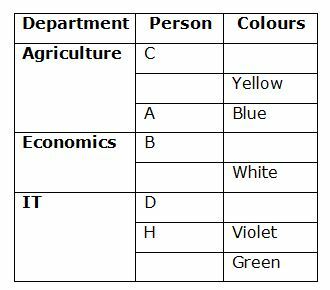 Eight persons A, B, C, D, E, F, G and H are working in three departments viz., Agriculture, Economics and IT. 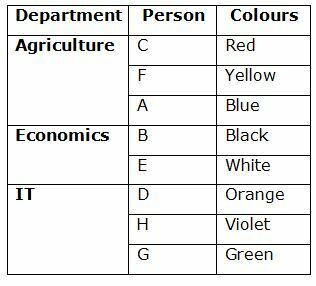 They all like different colours namely, Red, Yellow, Black, Violet, Green, Orange, White and Blue but not necessary in the same order.At least two persons and maximum of three persons working in the same department. C is working in the Agriculture department with the one who likes Yellow. D is neither working with B nor working in the Agriculture department. B is working in the Economics department only with the one who likes White. H likes Violet and does not work with the one who likes Red. H does not work with C. The one who likes Green working in IT department. A likes Blue and D does not like Green. E does not like Yellow and Green. F is working in the same department as the one who likes Red. D does not like Black. C is working in the Agriculture department with the one who likes Yellow. D is neither working with B nor working in the Agriculture department. 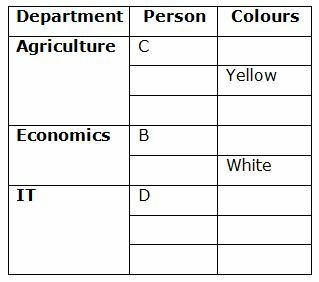 B is working in the Economics department only with the one who likes White. H likes Violet and does not work with the one who likes Red. H does not work with C. The one who likes Green working in IT department. A likes Blue and D does not like Green. E does not like Yellow and Green. F is working in the same department as the one who likes Red. D does not like Black. 2. Who among the following likes Black? 3. Four of the following five are alike in a certain way and they form a group. Which one of the following one that does not belong to the group? 4. D is working in which department? 5. 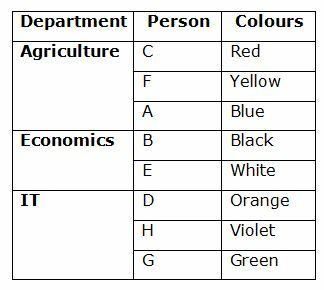 Which of the following groups belongs to IT department? Direction (6-10): These questions are based on six three-digit numbers given below. 6. If all the numbers are arranged in descending order from right to left, then which of the following number will be third from the right end? 7. If all the odd numbers are added with ‘2’ and all the even numbers are subtracted by ‘1’. Then, how many numbers will be divided by 3? 8. If the first and second digits are interchanged within all the numbers, then what will be the difference between the highest and second lowest numbers? 9. If the first and third digits are interchanged in all the numbers and then arrange them in ascending order from right to left. Then, what will be the fourth from the left end? 10. What will be the sum of the second digit of the third number from the right end and third digit of the second number from the left end? 2) Who among the following likes Black? 3) Four of the following five are alike in a certain way and they form a group. Which one of the following one that does not belong to the group? 4) D is working in which department? 5) Which of the following groups belongs to IT department? 6) If all the numbers are arranged in descending order from right to left, then which of the following number will be third from the right end? 7) If all the odd numbers are added with ‘2’ and all the even numbers are subtracted by ‘1’. Then, how many numbers will be divided by 3? 8) If the first and second digits are interchanged within all the numbers, then what will be the difference between the highest and second lowest numbers? 9) If the first and third digits are interchanged in all the numbers and then arrange them in ascending order from right to left. Then, what will be the fourth from the left end? 10) What will be the sum of the second digit of the third number from the right end and third digit of the second number from the left end?